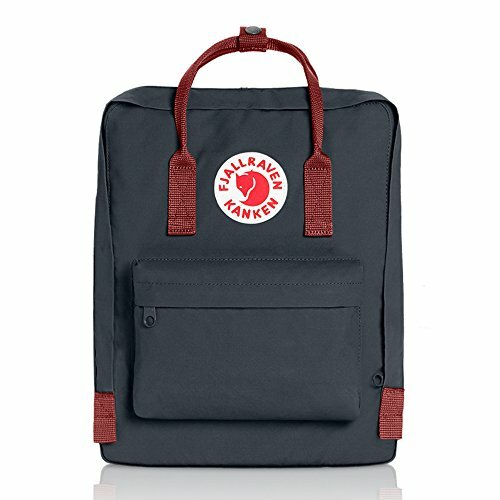 Fjallraven - Kanken Classic Pack, Heritage and Responsibility Since 1960, One Size,Black/Ox Red | What Should I Say? Kanken was launched in 1978 to spare the backs of school children. Back problems had begun to appear in increasingly younger age groups and shoulder bags were popular. Kanken has many simple, clear functions. The backpack soon became a common sight at pre-schools and nature schools around the country. The idea of using a backpack quickly spread, as did Kanken. It is just as popular today, and an excellent choice for school, outings or biking to work. Kanken is made out of durable, lightweight Vinyl on F. The large main compartment with a large opening makes it easy to put in/take out items. Two side pockets and a zippered pocket in the front. Handle at the top, narrow, supple shoulder straps, sitting pad in the pocket in the back and logo that doubles as a reflector. ICONIC SCANDINAVIAN DESIGN: The Fjallraven Kanken is a classic school pack that has been in style since 1978. PRACTICAL AND ATTRACTIVE MATERIALS: Made from dirt-resistant and water-resistant Vinylon F that can be wiped clean, the Kanken handles every adventure with ease. FORM AND FUNCTION: The Kanken has a 16L volume with two-way zip-around closure and rain flip. Inside the pack is a sleeve that fits most 15" laptops, plus a content information tag for personalization. VERSATILE AND ACCESSIBLE: There is a front zipper compartment and two side pockets. Featuring adjustable ergonomic woven shoulder "X" design straps and dual top snap handles. Specs; 15" (38 cm) x 10.6" (27 cm) x 5.1" (13 cm) and weighs 0.64 lbs. SUSTAINABILITY AND HERITAGE SINCE 1960: Started in the 1950's, in Northern Sweden by 14-year old Ake Nordin's idea to simply improve backpack design, Fjallraven has now expanded to every corner of the world. If you have any questions about this product by Fjällräven, contact us by completing and submitting the form below. If you are looking for a specif part number, please include it with your message.